I have always had a great relationship with my sister, and almost a year ago she had moved to Puerto Rico to work at the Spanish Consulate for two years. This summer was the first and only time she was going to come back home on holiday, so I was really looking forward to meeting her again. She had landed in Barcelona the previous night, and today she was going to drive up to Benasque early in the morning to spend a couple of days there with our parents. I had slept quite close to Benasque the night before to be able to make it there by noon, which was the time they estimated they would be arriving and I got up early to go for the last ride of my trans-Pyrenees trip. Just a bit south of Broto there is a tiny road leading east, the HU-631, which goes up and down through some narrow valleys before joining the main road in Ainsa. I had a great time on that ride, but my mind was already thinking about our little family reunion, so one I got back to the main road I hurried to Benasque, which I reached a bit earlier than expected. I texted my parents, who told me they were still on the way, so I went to the mountain lodge where they had made a reservation, unloaded the bike, had a shower, got changed and waited for them to arrive. Just as I was walking out of the lodge in the search for a cold beer, I saw my father’s green 4×4 pull into the car park, it had barely stopped and my sister was already leaping out of it, and we hugged, happy to see each other again. A long climb awaited the following day. 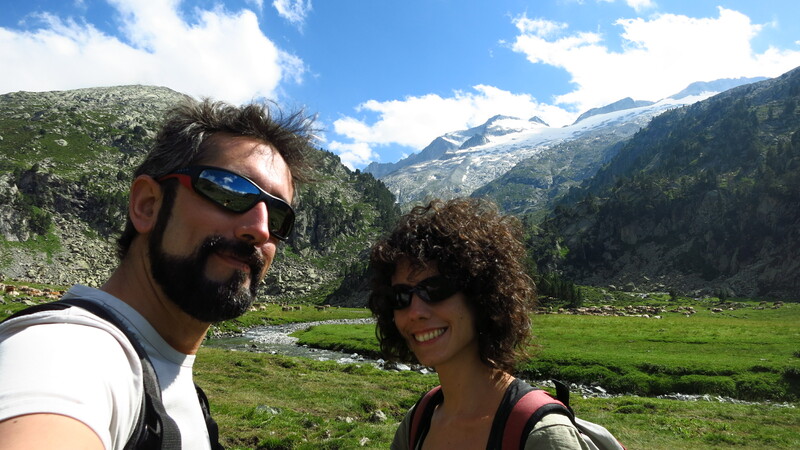 This entry was posted in Trans Pyrenees 2014, Travel and tagged Benasque, Oto by Kilian. Bookmark the permalink.